I love tri tip steak and think that they are best when gently smoked until they hit an internal temperature of 135F. Let me show you my technique as well as a few other methods you may want to try. How long to smoke a tri tip? Let’s get that question out of the way right off the bat. I smoke tri tips at 250F until they hit an internal temperature of 135F. 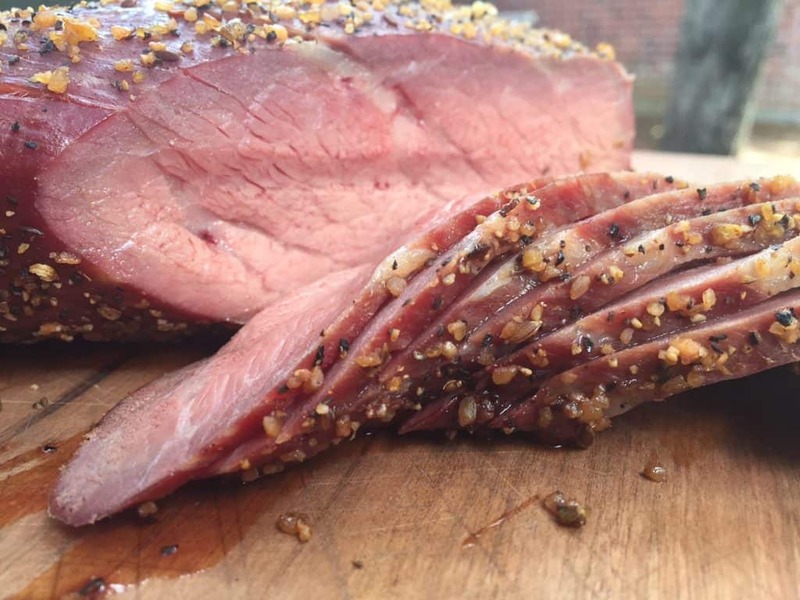 In general it takes about 30 minutes per pound so a two pound tri tip would need to smoke for an hour while a three and a half pounder will need about an hour and 45 minutes. Why Smoke a Tri Tip? The low temperature allows the meat to cook gently and achieve a uniform pinkness throughout the meat. When you grill a tri tip you with high temperature you end up with a steak that is pink in the center but has an over done outer ring of gray meat. Beef and smoke are excellent flavor partners. While chicken and fish are easily over powered by smoke, beef just seems to soak it up and get better with every wisp. I love the color that smoke adds to a tri tip. The deep red profile of a smoked piece of beef is a thing of beauty. You do NOT need to slow smoke a tri tip to get it tender. 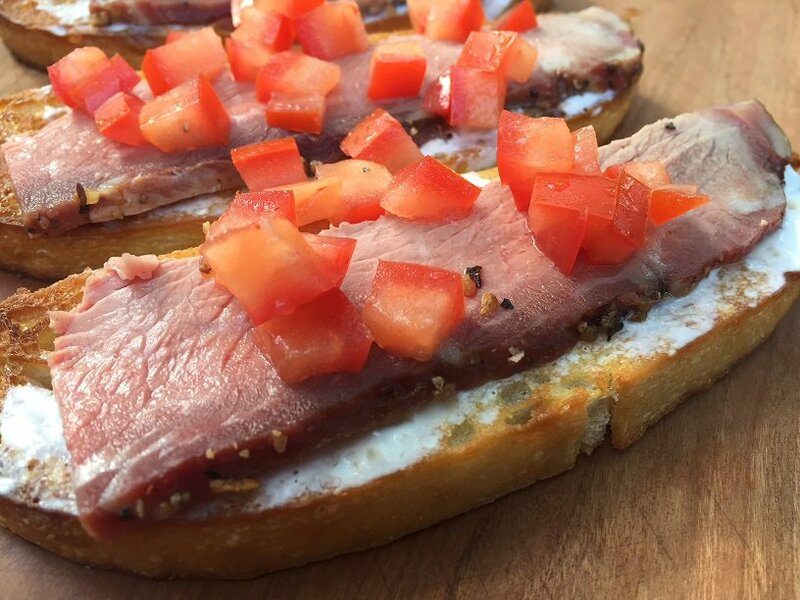 A tri tip is already tender as long as you slice it right. Start by dry brining the tri tip overnight. To dry brine you liberally coat all sides of the meat with kosher salt. Typically this will take a little less that one tablespoon of salt per pound of meat. Place the salted steak on a plate, cover loosely with foil and place it in the refrigerator overnight. The next day, thoroughly rinse the excess salt from the surface of the meat and pat dry with paper towels. 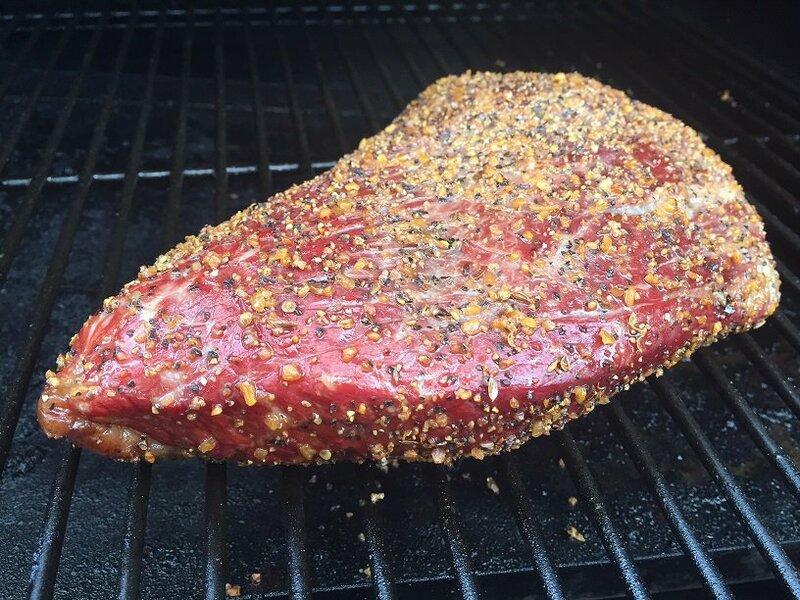 Season the tri tip with a salt free or low salt rub. There is already plenty of salt in the meat from the dry brine and you don’t need to add any more. I use McCormick low sodium Montreal Steak Seasoning. Apply the rub and allow the steak to rest at room temperature for an hour. This will let the meat warm up and cook more evenly on the smoker. Place the tri tip on your smoker at 250F using the wood of your choice (I prefer cherry) and smoke for 30 minutes per pound until the meat hits an internal temperature of 135F. Let the beef rest for as long as you can stand then slice thin against the grain and enjoy! Some folks go for the maximum smoke flavor possible so they slow down the cook. If you want to go this route then start with a cold piece of beef straight out of the refrigerator and lower the temperature of your smoker to 200F. This will extend the cooking time to about an hour per pound. Some folks like to take the tri tip to an internal temperature of 115-120F on a smoker and then finish the steak on a grill over extremely high heat to get a great surface sear. This will shorten the smoking time on a 250F pit down to about 20 minutes per pound. If you choose to use this “reverse sear” method then stick to salt and pepper for seasoning. Seared garlic turns bitter and is not something you want to eat. 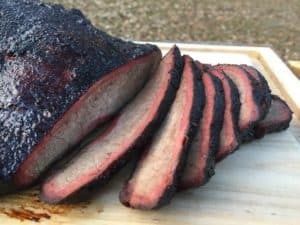 A new trend that I have been seeing is folks smoking tri tips like a brisket. They are going way past medium rare and cooking the brisket until it hits an internal temperature of about 200F. Here is a video by champion pitmaster Harry Soo trying out this method of smoking a tri tip roast. I am not going to get into the debate about whether tri tip should be smoked or grilled Santa maria style. You like what you like and that is all that matters!